To make a booking enquiry please complete the form below. We will contact you to confirm availability and complete your booking. Halsway Manor will not share your details with any third parties. 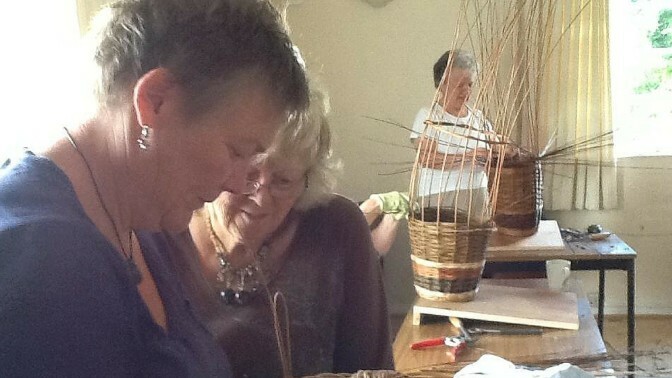 Basketry is one of the most ancient crafts still practiced today and a key part of Somerset’s rich heritage. Sarah Webb will guide you through the basics to make a round-base basket and write the recipe for that basket. More accomplished makers will be able to experiment with differing weaves to create pattern and texture, as well as borders, handles and lids (time permitting). The course offers a solid foundation for future learning, as well as being a fun and interesting first experience of basketry. Most people are able to complete one basket on this course. Suitable for all skill and experience levels. An introduction to basketry for complete beginners, or a useful refresher course for those with some prior experience. Sarah Webb is a highly skilled traditional and contemporary willow artist who was apprenticed to a traditional Somerset basket maker. She is an experienced tutor who enjoys passing on her skills, both technical and creative. You can book on a course at Halsway and bring a friend who can explore the area while using Halsway as a base for meals and accommodation. Halsway Manor is in the Quantock Hills (England’s first designated Area of Outstanding Natural Beauty). We’re just minutes away from the West Somerset Railway (one of Britain’s largest steam railways), Somerset’s Jurassic coast (ideal for fossil hunting), and the Exmoor National Park is right on our doorstep.